Ever thought you should do something about your monotone voice? New research has looked into how people react to monotone voices, and it’s really quite surprising. Firstly, guys with monotone voices actually seem to do better with women – in fact, a monotone voice was found to be even more of an asset than a deep one. This conclusion came from a ‘dating game’ experiment, where men were pitted against each other in a kind of ‘Blind Date’ format to win dinner with a woman. Contestants were asked to describe themselves to the anonymous woman and then tell their competitors why they were respected and admired by other men. The ones who did this with the steadiest tones were found to have had the most sexual partners in recent years, even more so than the guys with the deepest voices. But why? You might conclude that monotone voices are actually more attractive, but there’s no strong evidence for this – studies tend not to find much of a preference either way. For every David Attenborough or Morgan Freeman, there’s a Tom Hiddleston or Harrison Ford. Instead, researchers believe that their success comes not from the effect they have on women, but the effect they have on other men. Like a growl, that low monotone serves as a warning to any competitors. And with pretty good reason – men who speak with flatter tones tend to have stronger arms, higher levels of testosterone and higher ratings of dominance from men and women. Not only is everyone on the list a man, you have to go all the way down to #54 to find the first woman, Emily Blunt. 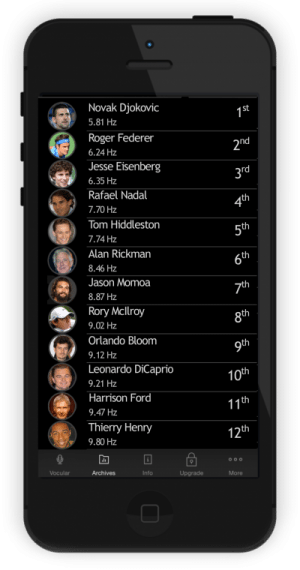 You also get some idea of why these voices are associated with a competitive personality – the list contains 5 of the 7 sportsmen in the database, and the three #1 tennis players from the last 10 years are all in the Top 4. James Bond actors also scored quite highly, and interestingly seem to tone it down even more when playing 007 – removing even more intonation from their voices. And James Earl Jones originally planned to voice Darth Vader with far more nuance before George Lucas told him to cut all that out. So why all the hate? If a monotonous voice is so great, then why do so many people want to change theirs? Well, there’s a bit of a linguistic trick going on here. See, the first paper to really look into vocal attractiveness also looked at why some voices were considered ‘monotonous’. Their finding: monotonous =/= monotone; men who varied their tones a lot were just as likely to be called ‘monotonous’ as ones who spoke with a fairly flat intonation. They never actually found out what made voices monotonous, although I’d guess it comes from the rhythm of a voice. So what’s the bottom line? Well, monotone voices are no less attractive than varied voices, although they are seen as being more manly. Thanks for this interesting post. Could you provide the reference of the research paper backing it up? Ok, great! I was mainly thinking about the ones focused on the link between monotone voices and attractiveness, but I guess it would be fantastic if you could share all your references on this topic! If you search it in Google Scholar, you’ll be able to find a free copy there. There’s also a great book called Everybody Lies by Seth Stephens-Davidowitz, which is mainly about using search data to learn things about people and various communities, but he also mentions a study which shows that one of the best predictors of whether a guy would get a second date is how monotone his voice became during the date. The points on vocal attractiveness come from a paper called “The attractive voice: What makes it so?” by Miron Zuckerman and Kunitate Miyake. I’m not sure how I got it, because I can’t find a free version online anymore, but if you can get one, the appendices were the most interesting part for me – they basically show correlations between a load of different acoustic and subjective features, like pitch variation and ‘deepness’ or ‘monotonousness’. Hope that helps and let me know if there’s anything else you want to know! Girl here. I hate monotonousness voices. I have pentrating voices. I love spearling lively voices on men and women. I cannot even listen to them, and I tend to talk all over them. They are the most annoying voices I have ever heard. That gravelly zero intonation flat voice that your uni lecturer had that either sent me to sleep, or made me visiably angry when I had to listen. I think Belgian men are the worst, because they all sound the same, with monotou=nous voice ( Sounds like they’re life is so miserable). So no, men with monotonousness will make me run a mile. How can I have good conversation with someone who sounds like they’re going to die? Hi Sophie, yes, as I say in the blog post, a monotone voice is a very different thing to a monotonous one. Monotone voices are actually no more likely to be described as monotonous than voices which are varied in pitch. You can kinda see this in the list above as well. Tom Hiddleston has a famously nice voice – but his is the 5th most monotone in our database. If that were such a problem, we’d expect him to be way down at the bottom instead. Hi, Monotone voices are as bad as monotonous voices. They have the same effect on me. So you don’t like any of the voices on the list of 12 above? Which men’s voices do you particularly like?